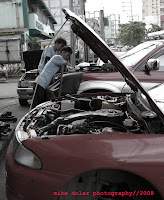 Here in Manila the auto body shops city of industry is located in Banawe Avenue in Quezon City. If you happen to go in that area, you will likely to see the different auto shops offering a wide selection of auto parts for sale. Of course they can provide repair as well if I'm not mistaken. I've been to this place just once and it happens to be late at night so I didn't get to see the stuff they are selling. Compared to the authorized service center of different manufacturers, auto parts are relatively cheaper here. No wonder that most car owners prefer to drop by this place first to check out the shops.